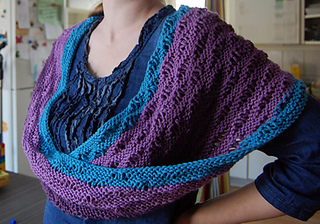 The small möbius works perfectly as a shawl and can be twisted two times around your neck without being too tight. The medium and large möbius lies looser around the neck and can be pulled over the head, still lying loose around the neck. On a child it can be twisted three times. The extra-large möbius can be twisted three times around the neck of an adult. This pattern has been written so your möbius is identical on both sides and the cast on is invisible.